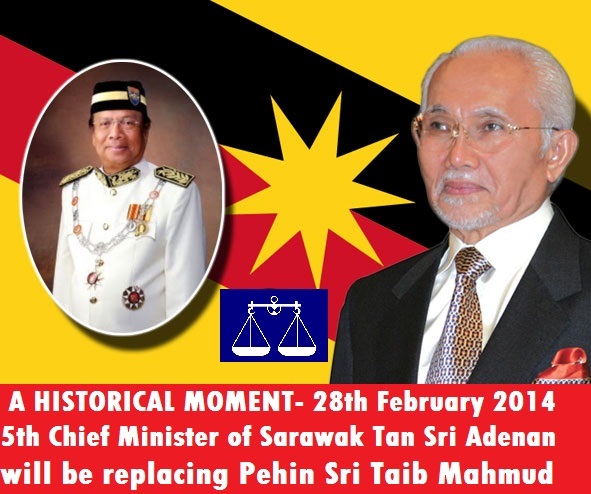 After helming the State of Sarawak for 33 years Pehin Sri Taib Mahmud will hand over the reign to a new man in Tan Sri Adenan Satem. In his tenure at the top CM Taib have developed Sarawak from a largely undeveloped state to a thriving and vibrant Sarawak where over 30 different ethnic races live harmoniously and peacefully as one. 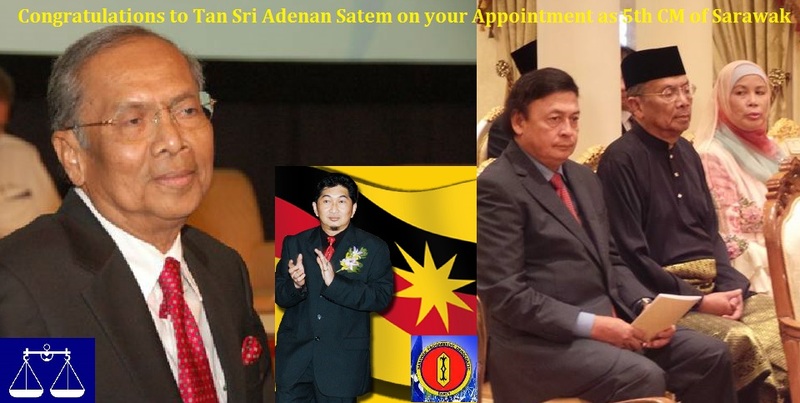 We say thank you to CM Taib for his unselfish services to Sarawak and we warmly welcome the new man in Tan Sri Adenan Satem. 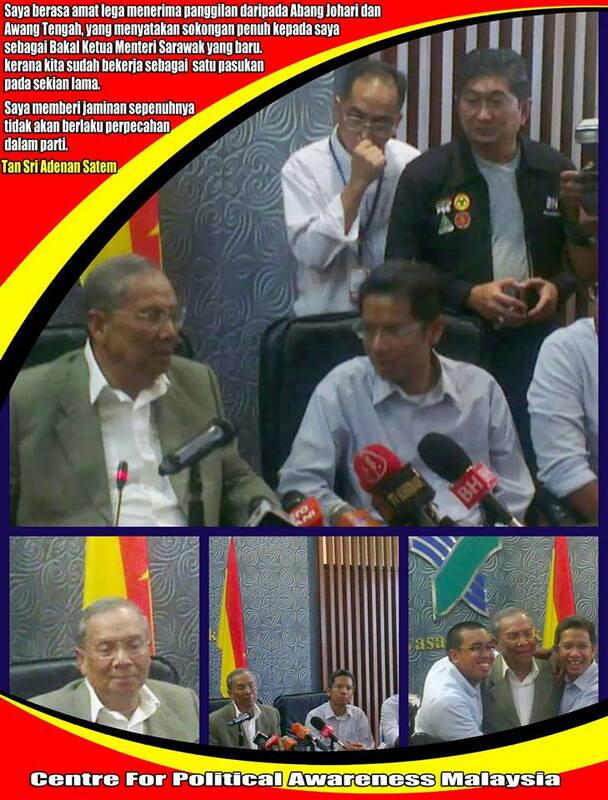 We wish him all the bests and May God Bless him to further develop and lead Sarawak for many years to come. I was totally aghast or was I when I saw this article in “malaysiakini” – Attempt to block Abang Johari from becoming CM?…Could there be some truths.? Many can come out with their theories and ‘shouting at their top of their voices like-‘TAK MUNGKIN” but as a state Sarawak knows bests. The leader that has been agreed by both the Federal and State BN Administration must have been thought of rationally and in the bests interest of the People of Sarawak. The former assistant minister who went to talk to the opposition mouthpiece must have been hoping that his “choice” would be chosen but unfortunately was not and decided to spin a mosts uncalled for,Unfounded and Unnecessary tale which was yesterdays story and not for the future direction of the State of Sarawak. The article below is for you to analyse and you can even comment but the target for now is the person ‘former assistant minister”who feels aggrieved on the whole situation. All this while, it has been widely believed that PBB deputy president (II) Abang Johari Openg will take over as the chief minister of Sarawak from Abdul Taib Mahmud – until Adenan Satem reappeared from semi-retirement in 2011. Adenan resigned as federal natural resources and environment minister before the 2008 parliamentary election and went into self-imposed exile. He reappeared in 2011, when Taib picked him to contest the newly-created state constituency of Tanjung Datu. After winning the seat, Adenan (left), a former brother-in-law of Taib, was appointed a special adviser to Taib with the status of a minister. Months later he was appointed special functions minister of Sarawak. He was also made the PBB information chief. Was Adenan’s return to politics part of a conspiracy to ensure that Abang Johari would not take over as the next Sarawak chief minister? A former assistant minister and confidant of Abang Johari believes there was such a plan. The plot for a Melanau to continue being the chief minister of Sarawak is alleged to have been hatched in Mecca by Taib, Adenan, senior PBB vice-president Awang Tengah Ali Hassan and former Perlis mufti Juanda Jaya. Born and bred in Mukah, Juanda (left) is tipped to be the candidate for Balingian when Taib resigns as its assemblyperson. “Everything was planned in Mecca. During the PBB supreme council and party caucus meeting, someone suggested that Taib be given the mandate to select his successor, instead of going through the election process. “There was nothing Abang Johari and the other PBB leaders could do to reverse the decision. 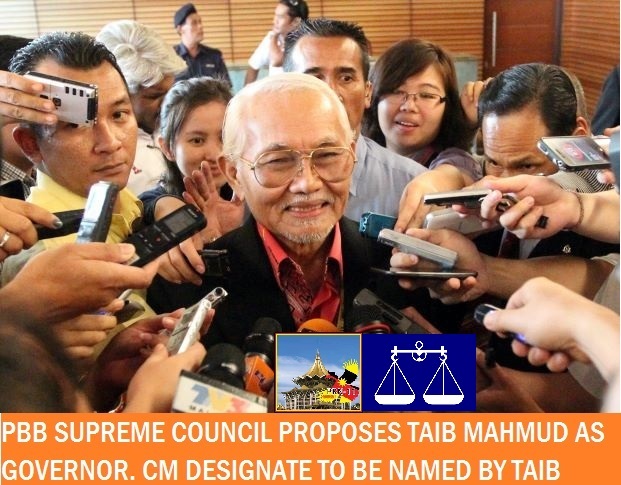 “But if there was a fresh election to the PBB supreme council and caucus to chose Taib’s replacement, Abang Johari would have won as he has the support of members of the supreme council as well as the Dayak members of the council,” the former assistant minister said. But could this private meeting in Mecca, seen as a “back-stabbing” by some PBB leaders, trigger a crisis within the party? “Possible, if it is not handled carefully,” he said, without elaborating. He said that as “interim’ chief minister”, Adenan would not be able to convince the Chinese to return to BN. Likewise, he may have some problems getting the full support of the Dayak community, especially the Ibans. Under Taib’s 33 years of authoritarian rule, the Dayaks, particularly the Ibans, have been marginalised and suppressed in terms of development and deprived of roads to their longhouses as well as the supply of clean water and electricity. Much of their native customary right lands have also been forcefully taken from them and given to oil palm plantation companies. The participation of the Dayak community in the state government has also taken for granted. For the Kayan, Kenyah and Penan communities, their ancestral lands, longhouses and villages have been submerged by the Bakun Dam, and more of their lands and properties will be displaced by the construction of Baram Hydroelectric Dam. Among the first Sarawak leaders to express concern about Adenan heading the state government was Parti Rakyat Sarawak president James Masing, who wants Adenan to ensure genuine power-sharing in the state administration – or, he fears, the Sarawak BN will have problems facing the coming state election. “The Dayak community must be recognised not just in terms of the development it requires, but in terms of power-sharing as well. Do not sideline the Dayaks in these two areas because we are going to face a lot of educated Dayaks in the election and they know where they stand. “The main hurdle is going to be in the Dayak-majority seats,” said Masing (right), who is Sarawak land development minister and very senior in the state cabinet. There are 29 Dayak-majority state seats, while another 27 seats are Muslim-majority. Non-governmental organisation Save Sarawak Rivers Network (Save Rivers) said there is nothing to shout about as the change in government leadership is superficial. “The way PBB is allowing Taib to make his personal choice is disgusting, and that is its idea of democracy. “It shows that the power is already abused, and for that reason I do not expect any drastic change,” said a spokesperson for Save Rivers. Adenan, he added, is a well-known Taib loyalist and too frail and old to carry out major changes that are required to clean up the havoc and neglect resulting from many years of bad governance. Since Adenan was chosen by Taib himself as the next chief minister, it is believed that Adenan will continue with Taib’s plans. “In other words, it is ‘old wine in a new bottle’ and for the Orang Ulu community, it is going to be difficult to support a government that will continue to build dams and destroy their livelihood,” the Save Rivers spokesperson added. An Iban leader who did not wish to be named said if the Iban community has pride and dignity, they will never accept a non-Dayak as their chief minister. “This stand is further reinforced by the democratic principle that the majority should rule. Why should we surrender this simple principle?” he asked. He said it was difficult for some Ibans to forget the famous statement Adenan made to the state assembly in 1985, when he was assistant land development minister, on the Balai Ringin land issue. Adenan’s use of unparliamentarily words such as “plunderers, land-grabbers, troublemakers agitators and pseudo-champions” to describe a certain group of Ibans trying to protect their ancestral land there had angered other Ibans and even those from his PBB. Several police reports were made against him. The Ibans of Balai Ringin found out that their ancestral lands had been surveyed and later, their titles to 1,155 plots of land had been issued to non-natives. Once the non-natives received their land titles, the Ibans were chased out from their longhouses and farms. Another incident the Ibans could not forget was when Adenan poked fun at the Iban “miring” ceremony by shouting “Whooh-ha, whooh-ha, whooh-ha” seven times before he officially opened the function. These words are used by Iban shaman to call for “gods and spirits” to attend their functions with plates of offerings or “miring”. Fed-up with Adenan poking fun at the Iban ceremony, an Iban member of PBB told him that those words were sacred to the community. These are words used in prayers to the gods and spirits to attend their functions. If there was no offering, the gods and spirits who came would be angry and they would curse the caller. Adenan has since then stopped shouting those words, but he did fall sick and it is not known whether this was the result of a curse from angry gods and spirits. Years later, Adenan also learnt how costly it is to trample on the Ibans over the land issue and making fun of their “miring” ceremony. This came with his trouncing for the post of deputy president of PBB by Abang Johari, despite Taib openly declaring his support for his brother-in-law. Abang Johari won as a result of backing from the Dayak members of PBB. How could the Dayaks, who form two-thirds of Sarawak’s population of 2.6 million, forget him his dire behaviour in the past, now that he is going to be their new chief minister? RELA LAND…State Government to identify..!! 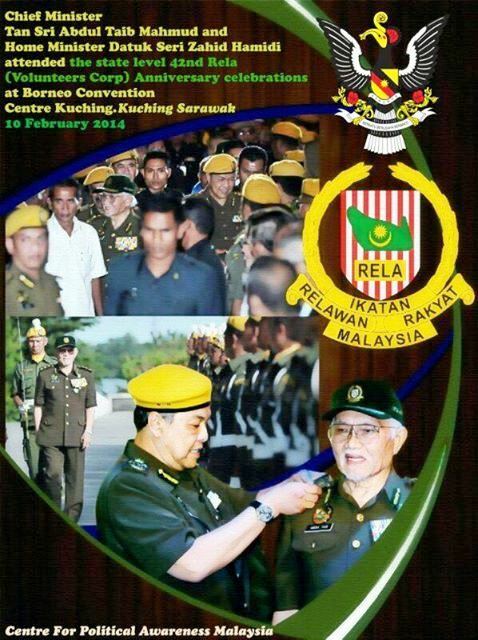 CM Sarawak Taib “pledges land for RELA Headquarters when he said that the Sarawak State Government will identify a piece of suitable land. That’s a very good gesture on the part of the Government. Chief Minister Tan Sri Abdul Taib Mahmud announced three names as his successor during the closed door meeting of the PBB supreme council. They are deputy president Datuk Amar Abang Johari Tun Openg, vice-president Datuk Amar Awang Tengah Ali Hasan and information chief Tan Sri Adenan Satem. Party insiders, who were at the meeting, confirmed with The Star that the three names were offered by Taib, one of whom would succeed him. At a press conference after the meeting, which was chaired by PBB constitution committee chairman Datuk Amar Mohamad Asfia Awang Nasar, reporters could not get a confirmation on the names. When specifically asked if the list of successors boiled down to the three names, Asfia replied: “It’s possible”. At the same time, outside PBB’s meeting room where the press conference was taking place, Awang Tengah told reporters he would “support whoever he (CM) decides on”. In the media frenzy, Adenan had left PBB headquarters without being asked for comments.